The franchise that became known as the expansion Senators had an 11-year run in Washington, from 1961 through 1971, before moving to the Dallas-Fort Worth area and becoming the Texas Rangers. The expansion team, created as soon as the original Senators departed for Minnesota, essentially had three sets of owners. None of them could make the team a contender. The last, Robert E. Short, borrowed heavily to purchase the team and subsequently convinced his fellow owners he couldn’t survive financially in Washington. 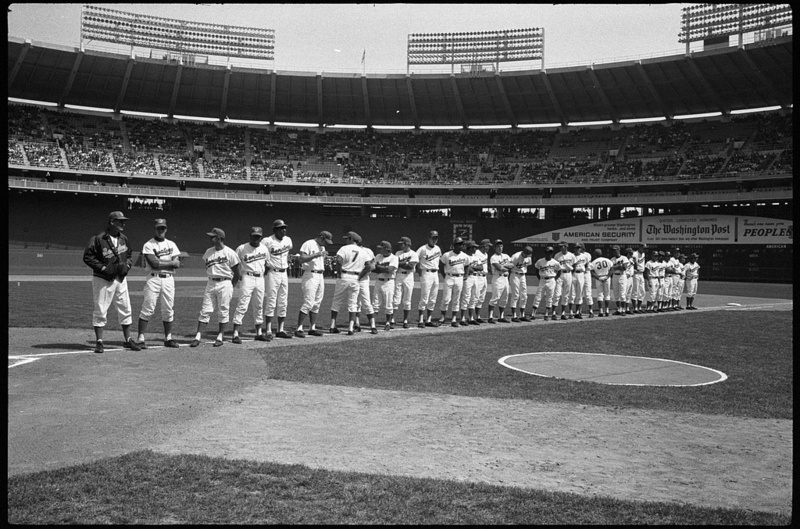 After 60 seasons as one of the charter members of the American League, the original Washington Senators franchise received permission on October 26, 1960, to relocate. Senators President Calvin Griffith had been increasingly anxious to move after he and his sister became majority owners following the death of their uncle, Clark Griffith, in October 1955. Even after plans for a new multipurpose stadium were approved in September 1958, Griffith remained noncommittal about staying in Washington.1 When the site in the Southeast section of the city was chosen for what was to become District of Columbia Stadium, Griffith said he preferred a location in the far Northwest part of D.C., an upscale area with a substantial white population. 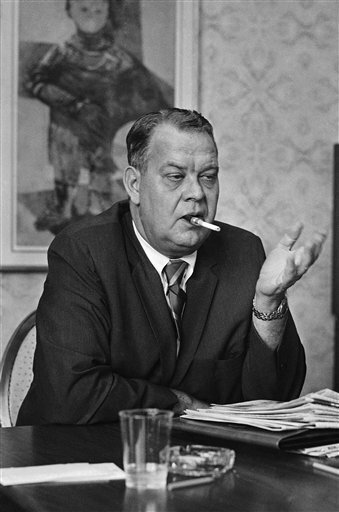 After winning a May 1959 court challenge to his right to leave town, Griffith had stated that “moving the Washington franchise is not my intention.”2 Yet as the 1959 season ended, Griffith formally notified the president of the American Association that the Senators would move to Minneapolis, which had been home to a minor-league American Association team.3 Griffith soon learned that at least five AL owners would veto any move, however, so he did not seek a formal vote. The Senators would remain in Washington for the 1960 season. The ownership group was incorporated as “Senators, Inc.,” leaving no doubt the new team would retain the old team’s name.7 Each of the 10 investors had an equal share. Over the next two years, it was reported that the 10 investors had put up as much as $300,000 each for the franchise. Quesada was married to the granddaughter of publisher Joseph Pulitzer. She had inherited part of the family fortune. 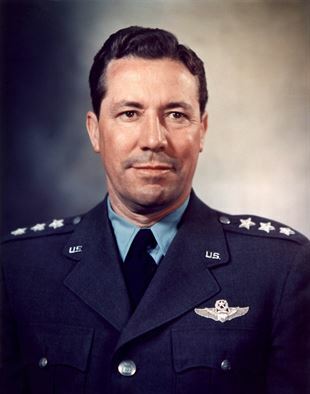 After a 25-year career in the military, Quesada had been an executive at Lockheed Aircraft before President Dwight Eisenhower chose him as the first administrator of the newly established FAA. In his first two days as team president, Quesada hired Ed Doherty, president of the American Association, as his general manager and Mickey Vernon, the popular Griffith-era first baseman, as manager. Eleven days into the Quesada ownership, the team acquired its first two players in the draft of minor leaguers. On December 14, 1960, at American League offices in Boston, representatives of the Senators and the Los Angeles Angels, the other expansion team, each picked 28 players from a pool of those left unprotected by the eight existing AL teams. Washington was represented by Doherty, Vernon, and farm director Hal Keller.8 The owners of the expansion teams each had to spend $2.25 million to participate in the draft. The existing teams were required to expose seven players from their August 30, 1960, active rosters and eight others from their 40-man rosters. The price was $75,000 each for the 28 players Washington drafted from this list. None of the existing teams was allowed to lose more than seven players. Washington and Los Angeles each were required to select 10 pitchers, then two catchers, six infielders, and four outfielders. The teams also could pay $25,000 each for a nonroster player from the eight existing franchises. Washington ended up selecting three such players for a total of 31. On April 10, 1961, President John F. Kennedy attended the season opener along with a crowd of 26,750 at rickety Griffith Stadium. After a surprising start in which the team split its first 60 games, the expansion Senators began performing as had been expected. The team ended in a tie with the Kansas City Athletics for ninth place at 61-100. The Senators drew just 597,287 fans, trailing the 10-team league in attendance. (The old Senators had drawn 743,404 with an improved team in 1960.) The final game at the old park attracted just 1,498. The Senators lost to the ballpark’s previous occupants, the Minnesota Twins, 5-1. 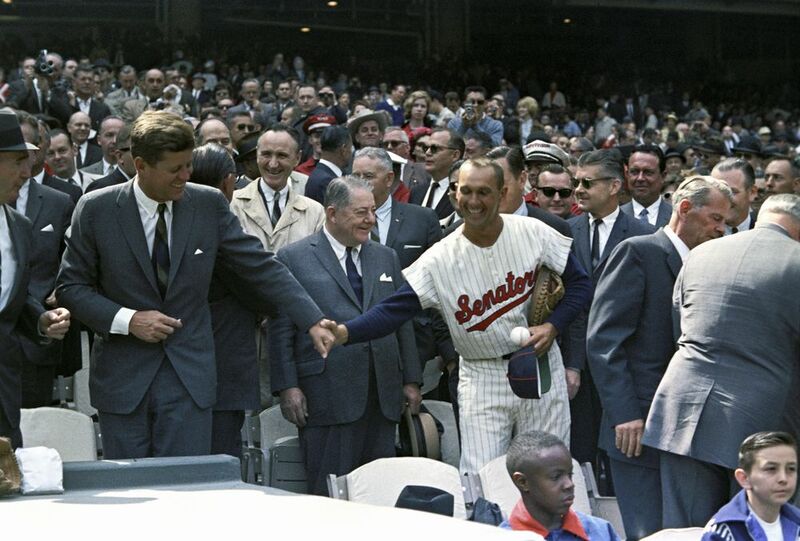 The Senators played the season’s opener in their new ballpark on April 9 before President Kennedy and a capacity crowd. A Nats victory over the Tigers was soon followed by a 13-game losing streak.11 By the All-Star break, the team was 26-54, deep in last place. In August 1962, Quesada told a reporter he was on the verge of making wholesale changes in management, making it clear that the jobs of Doherty and Vernon were jeopardy. The owner said the team lacked punch, especially at first base and third base. The incumbent first baseman, Harry Bright, who had homered in that day’s game, confronted Quesada in the clubhouse after reading his comments.12 Although Bright tied for the ’62 team lead in homers (with 17), he was traded in the offseason. As the season ended, Quesada asked Doherty for his recommendations about how best to improve the team. The GM told him Vernon should be fired. Instead, Quesada fired Doherty and extended Vernon’s contract for another year. A replacement GM wasn’t hired until November 21, when the job went to George Selkirk, the former Yankee who had served as a minor-league manager, coach, and front-office executive for three organizations. Shortly after Quesada had said that a new GM would have authority over baseball operations — “with my approval, of course”13 — Quesada promised Selkirk a free hand over player personnel and contracts. Although 1962 was another dismal season on the field, the new stadium helped boost Senators attendance 22 percent to 729,775, an average of just 40 fans a game fewer than the Boston Red Sox drew at Fenway Park. Still, Senators, Inc. lost $125,000 in 1962. In January 1963, Quesada issued a much-ballyhooed three-part report on the team’s first two seasons. Among other complaints, he was sharply critical of the coverage of the team in the city’s three daily newspapers. A week after the release of the third part of his report, Quesada sold his shares, as did four of the other 10 original investors, to the remaining five. One of the five, James M. Johnston, an investment banker, was named chairman of the board. The deal was arranged quickly to counter an offer of $5 million for the team made by former Cleveland Indians stockholder Nate Dolin and longtime baseball executive Bill Veeck, who had been rumored for months to be interested in buying the Senators. Johnston said he and his partners stepped in to ensure that the team remained in local hands. The new board chairman, Johnston, a North Carolina native, had been a pilot in France during World War I as a young Army lieutenant. He had graduated from the University of Illinois after two years at the University of North Carolina, where years later he created a foundation that to this day provides need-based scholarships. Lemon was Johnston’s business partner. Johnston and Lemon had been in investment banking together in Washington since 1926. Johnston told the Washington Post’s Bob Addie that he had been broke a few times. He bounced back to the point that he “once wrote a personal check for $30,000,000,” Addie reported.16 The two partners had tried to buy a controlling interest when the expansion franchise was created, Johnston said, but he and Lemon were each limited to a 10 percent share. In May, Selkirk was allowed to hire former Dodgers star Gil Hodges to replace Vernon as manager. The expansion team had its worst season on the field, losing 106 games, and at the box office, drawing a league-low 535,604 in 1963. Those results produced a loss of $1.2 million. Although the Nats escaped the cellar in 1964, attendance barely topped 600,000. On the field, the Senators gradually improved a bit under Hodges, but attendance showed scant improvement: a league worst 576,260 in 1966. The disappointing figure prevented the Armory Board, which operated D.C. Stadium, from making principal payments on the bonds that had been issued for construction. The board was paying $800,000 annually in interest on the bonds. The stadium’s deficit in 1965 was $601,000. By early fall, however, Johnston had fallen ill, so co-owner Lemon took over as the team’s chief executive. A sixth-place finish in 1967 helped attract 770,868 fans — an increase of almost 195,000 over 1966. But as soon as the season ended, Hodges resigned to become manager of the New York Mets. Then, on December 28, Johnston died of cancer. Lemon succeeded him as chairman of the board and signed off on Selkirk’s choice of former Griffith-era Senators slugger Jim Lemon — no relation to the owner — as the new manager. At the time, Short was the treasurer of the Democratic National Committee. He had run unsuccessfully for Congress in 1946 and for Minnesota lieutenant governor in 1966. He also had been a major fund-raiser for Hubert H. Humphrey’s presidential candidacy. Short was familiar with Washington, having attended Georgetown University Law School and served as an assistant U.S. attorney in the Justice Department. Lemon was insisting that new ownership keep the team in D.C. and wanted to retain a 10 percent share of stock. Finally, he agreed to sell to Short alone for $9.4 million and an option to buy back up to 20 percent by the spring of 1969. Paulucci refused to sign for the needed loans, and pulled out. The final agreement on the sale was reached on December 3, 1968. Lemon exercised his option to keep a 10 percent share (for a reported $1.1 million) and remained on the board. 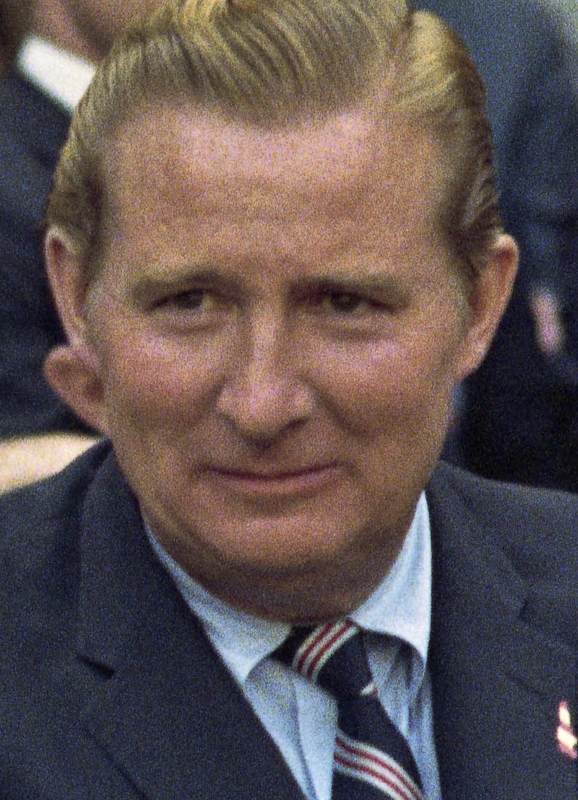 Short became owner when the deal closed on January 28, 1969. Under baseball rules, Short had to sell his 399 shares of Twins stock. It wasn’t long before Short began making ominous statements about Washington’s commitment to keeping a team. He demanded that fences be built around the outer parking lots of the recently renamed Robert F. Kennedy Stadium, implying that the area was unsafe. He blasted fans for their lack of support. “Look at last year’s attendance. I can round up a girls’ team and draw 500,000,” Short said in February. “If they don’t want the Senators here … then Dallas or Milwaukee or some other places do.”25 Coincidentally (or not), two exhibition games at the end of spring training, scheduled to be played in Louisville, were transferred at Short’s suggestion to Arlington, Texas. The arrival of Williams brought unmistakable excitement to the Senators’ 1969 season. He didn’t disappoint. 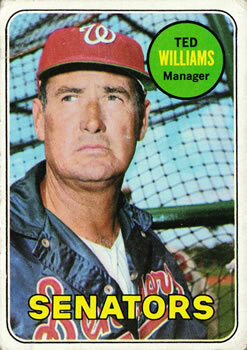 Nearly all the hitters improved as Williams led the team to 86 victories and was voted AL Manager of the Year. Washington fans showed they would support a decent product on the field, boosting attendance to a franchise-high 918,106 despite Short’s big hike in ticket prices. (Mezzanine box seats went from $3.50 to $5, for instance.) The Senators’ attendance increase was the highest in the league. Yet despite another 20 percent increase in ticket prices, the 1970 Nats still drew 824,789 fans, the second highest total in their 11-year existence. On October 9, Short made what turned out to be a disastrous trade with the Tigers, sending Detroit shortstop Ed Brinkman, third baseman Aurelio Rodriguez, and pitchers Joe Coleman and Jim Hannan for a washed-up Denny McLain and three journeymen. McLain lost 22 games for the 1971 Senators. Coleman won 62 games in his first three seasons in Detroit as he, Brinkman, and Rodriguez became key parts of the 1972 AL East champion Tigers. The next May, Short traded closer Darold Knowles and first baseman Mike Epstein to Oakland, thus putting five former Nats stars in the 1972 American League Championship Series. Meanwhile, Short was in disputes with Pompano Beach, Florida, where the Nats trained, and with the D.C. Armory Board over rents and facilities. He visited training sites in Arizona, threatening to leave Florida if Pompano Beach didn’t make improvements. He told the Armory Board he wanted a rent deal for RFK Stadium similar to Milwaukee’s, under which he would pay just $1 a year until the team reached one million in attendance. In testimony before a congressional committee the previous fall, Short said he had lost $1.8 million in his first two years as Nats owner. “I can’t maintain the team under the present condition. … I don’t want to move to Dallas or Toronto. I want the team to stay in Washington,” Short told the committee. When spring training began in 1971, the Senators had undergone a 50 percent roster turnover. Among the new faces was Curt Flood, lured back from Europe by Short with a $110,000 contract that contained a provision that allowed Flood to continue his suit challenging the reserve clause. Short sent three minor leaguers to Philadelphia, the team to which Flood had been traded, in a complicated transaction that raised eyebrows and had to be approved by Commissioner Bowie Kuhn. The Nats owner promised Flood that he would not be traded and that he would make him a free agent after the 1971 season, if Flood wanted out. None of this was in writing, of course.37 A year off, however, took its toll on Flood’s skills. After a horrible start, he abruptly left the team in early May and returned to Europe. Kuhn, who worked as a scoreboard operator at Griffith Stadium as a youth, started looking for a corporation willing to buy the team. The Armory Board, meanwhile, came up with a compromise plan that it said would save Short $125,000 a year in rent. Short, whose lease was expiring, said it was too late. Chicago White Sox owner John Allyn contacted Joseph B. Danzansky, president of the D.C. Board of Trade and the head of a local supermarket chain, to ask if he could come up with an offer for the team. On September 21 in Boston, Danzansky appeared alone before the owners and their attorneys with an offer of up to $9.3 million — $2.7 million in cash and a loan of $6.6 million — for Short’s share of the team. The offer was rejected as too risky.42 The mayors of Dallas and Fort Worth, meanwhile, were among a nine-person delegation from Texas that made a presentation for the team. Short presented detailed financial figures and projections, which obviously had taken months to prepare, in support of relocating his franchise to Texas. The year after Short moved the team to Texas, two Brookings Institution economists, relying on figures Short gave his own accountants, concluded that he had spent just $1,000 of his own money — what it cost to incorporate — to buy the Senators. He borrowed the rest.47 Several members of Congress called for hearings to investigate Short’s finances and introduced bills to revoke baseball’s exemption from antitrust laws, but nothing came of those efforts. ANDREW SHARP grew up in the D.C. area as a fan of Washington Senators I and II, and spent 30-plus years in the wilderness as a New York Mets fan before happily regaining a Washington team to support. A retired newspaper editor, he began writing BioProject essays in 2017 and has written SABR’s ownership histories of the Griffith era and the expansion Senators. He charts minor-league games on a freelance basis for Baseball Info Solutions. 1 Dave Brady, “Cal Griffith Non-Committal on New Park,” The Sporting News, July 20, 1960: 10. 2 Shirley Povich, “‘No Intention to Move Nats,’ Griffith Says,” The Sporting News, June 3, 1959: 11. 3 J.G. Taylor Spink, “Nats Will Shift to Minneapolis, Griff Notifies Doherty and A.A.,” The Sporting News, October 7, 1959: 1. 4 Tom Deveaux, The Washington Senators, 1901-1971 (Jefferson, North Carolina: McFarland & Company, 2001), 207. 5 Associated Press, “A.L. Going Into Los Angeles and Twin Cities in 1961,” St. Louis Post-Dispatch, October 27, 1960: 56. 6 Associated Press, “3 Groups Apply for Washington Franchise; AL Chiefs Ponder Los Angeles Move,” Rochester Democrat and Chronicle, November 18, 1960: 30. 7 James R. Hartley, Washington’s Expansion Senators (1961-1971) (Germantown, Maryland: Corduroy Press, 1998), v.
8 Andy McCue and Eric Thompson, “Mismanagement 101,” The National Pastime 2011, Society for American Baseball Research, Phoenix: 43. 9 Povich, “Senators in Red by $250,000, but Increase Budget for 1962,” The Sporting News, January 10, 1962: 24. 10 Jay Roberts, “Return to RFK,” Jaybirds Jottings blog, January 17, 2005, jay.typepad.com/william_jay/2005/01/return_to_rfk.html, accessed Dec. 30, 2017. 11 The original franchise was officially the Nationals until after Clark Griffith’s death, even though the team was popularly known as the Senators, thus the shortened nickname, the Nats, which carried over to the expansion franchise. 12 Povich, “Nats’ Vernon, Doherty Face Quesada’s Ax,” The Sporting News, August 25, 1962: 24. 13 Povich, “Nats Rumor Mill Spills Hot Tidbits in Series Chatter,” The Sporting News, October 20, 1962: 25. 14 Associated Press, “Says Senators Are for Sale, but No Takers,” Racine (Wisconsin) Journal Times, September 28, 1968: 10. 15 Povich, “Quesada Cashes In — All Quiet Again Along the Potomac,” The Sporting News, February 9, 1963: 14. Among the original 10 investors who along with Quesada sold their shares were Katharine Graham, Agnes’s daughter and the wife of the Post publisher; Mrs. Robert Levi, wife of a department store owner; George A. Garrett, a former ambassador to Ireland; and banker George Y. Wheeler. 16 Bob Addie, “Financial Wizard Johnston Serene in Nat Red Ink Sea,” The Sporting News, January 23, 1965: 18. 17 goprincetontigers.com basketball all-time records; bit.ly/2zzOXTX, accessed December 26, 2017; gwsports.com/sports/m-baskbl/archive/yearbyyear.html. 20 “Johnston Dons His Santa Suit; New Pacts in Nat Brass Socks,” The Sporting News, January 7, 1967: 26. 21 Merrell Whittlesey, “Lemon Says ‘Chips Too High,’ May Sell Senators Before ‘69,” The Sporting News, October 12, 1968: 17. 22 Whittlesey, “Sale of Nats Near — Ask $10.5 Million,” The Sporting News, November 11,1968: 36. 23 Shelby Whitfield, Kiss It Goodbye (New York: Abelard-Shuman, 1973), 9. 25 Short Takes Long Look at Lack of Radio Outlet,” The Sporting News, January 18, 1969: 41. 26 Ben Bradlee Jr., The Kid: The Immortal Life of Ted Williams (New York: Little, Brown and Company, 2013), 529. 28 C.C. Johnson Spink, “We Believe” column, The Sporting News, January 17, 1970: 14. 29 Addie’s Atoms column, The Sporting News, June 13, 1970: 16. 30 Whittlesey, “Short Just Won’t Stand Still, Seeks More Nats’ ‘Faces,’ The Sporting News, November 14, 1970: 49. 31 Whittlesey, “Nats Nab McLain to Bolster Sagging Gate,” The Sporting News, October 24, 1970: 11. 32 “Senators Need Help, but Franchise Shift Is Unlikely — Kuhn,” The Sporting News, October 24, 1970: 20. 34 “Shed No tears for Short,” editorial, The Sporting News, September 14, 1971: 14. 35 “Addie’s Atoms” column, The Sporting News, February 6, 1971: 14. 38 Whittlesey, “Senators in Financial Shorts, Seek League Lift,” The Sporting News, July 12, 1971: 27. 40 Ron Fimrite, “Bad Case of the Short Shorts,” Sports Illustrated, August 9, 1971, accessed online December 29, 2017, at si.com/vault/1971/08/09/612074/bad-case-of-the-short-shorts#. 41 Edgar Munzel, “Table Gets Bulk of Play at Major Confab,” The Sporting News, August 21, 1971: 5. 42 Danzansky two years later was heavily involved in a nearly successful effort to get the San Diego Padres to relocate to Washington. 44 Jerome Holtzman, “A $7.5 Million Bonanza for Short?” The Sporting News, October 9, 1971: 12. 45 Ken Denlinger, “Washington’s Storied Past Includes Unhappy Endings,” Washington Post, March 3, 1991: D1. 46 “How to Succeed in Baseball,” editorial, The Sporting News, October 9, 1971: 14. 48 Hartley, 106; Deveaux, 250. 50 Whittlesey, “Senators Expire Amidst Love for Hondo, Hate — and Forfeit,” The Sporting News, October 16, 1971: 34.